Calida is a girl’s name of Greek and Spanish origin. Its meaning, “most beautiful; heated, with warmth,” perfectly matches my new lace cocoon cardigan. 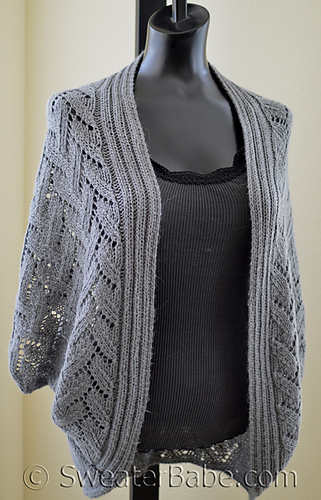 This stylish open cardigan is the epitome of elegance in a knitwear item! 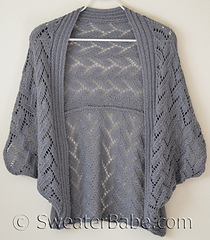 Gorgeous alpaca/silk yarn is knit in a lace stitch pattern with just enough openness to keep it light and airy, but not so much that the cardigan loses its structure. 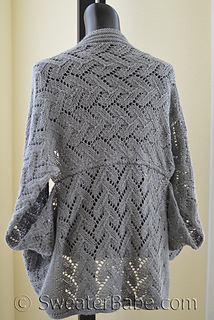 The silk content of the yarn allows this piece to glide over your shoulders and drape beautifully over tank tops, maxi dresses, long-sleeve blouses, and so much more. Its simple structure makes it an easy project to create (it’s been my portable project for the last few weeks) and also the perfect item to fold flat to pack for your next weekend trip or summer escape. The open front, cocoon silhouette is just what you’ll reach for whenever there’s the slightest hint of a chill. 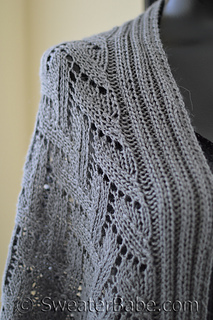 A sophisticated alternative to the rectangular or triangular shawls that require a shawl pin.